The following review is for a product called Weleda Stretch Mark Massage Oil. 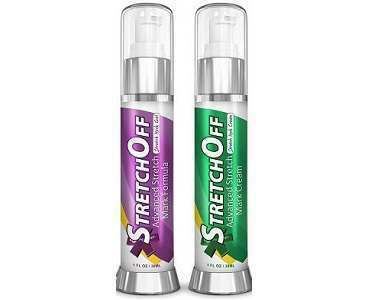 A product formulated to reduce stretch marks. This product should be used during and after pregnancy to support the skin to become smooth and flexible. What’s in Weleda Stretch Mark Massage Oil? Sweet Almond Oil – is a lubricant which gives the skin a soft and smooth appearance. Jojoba Oil – speeds up cell regeneration, used to treat scars, acne, and wrinkles. Wheat Germ Oil – is a skin conditioning agent. Arnica Montana Flower Extract – helps soothe and renew the skin after exposure to stress. Limonene – is used to penetrate the skin. Linalool – used to make fragrances and flavors. Citronellol and Geraniol – are used to provide a sweet, floral scent. Citral – skin irritant and sensitizing agent in concentrations of greater than 8%. Eugenol – used for its antiseptic and anti-inflammatory properties. Farnesol – is used to smooth wrinkles and increase skin’s elasticity. Parfum – Fragrance. The formulation of ingredients in this massage oil could be much more effective if clinically proven ingredients were added, such as Onion bulb extract (for reducing scarring significantly), Aloe Vera (used to speed up the healing process), Emu Oil (relieves red or damaged tissue, moisturises, nourishes, and protects the skin with its unique combination of omega 3,6 and 9 oils), Safflower (soothes, smoothes and softens the skin and maintains elasticity in the skin), and Sunflower Oil (prevents the skin from drying, provides antioxidant qualities). How Do You Use Weleda Stretch Mark Massage Oil? It is recommended to use this stretch mark oil two to three times daily, by using circular massage movements over the stomach, thighs, breasts, and bottom. If the consumer is pregnant, this product should be used from the start of the pregnancy up to three months after birth. Open wounds should be avoided when using this product. One bottle (3.4 fl oz) at a price of $25.50 (excluding tax) may be purchased online from the manufacturer’s website as well as various third-party retailers. This product comes with a 30-day money back guarantee. If the consumer finds that the product is damaged or is not satisfied with the purchase, it may be returned for the money in return or for an exchange. The consumer reviews are very positive. 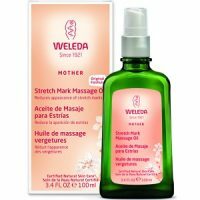 As we have reviewed Weleda Stretch Mark Massage Oil we have found that the manufacturer offers a very attractive guarantee and that the consumers seem to be most pleased with this product. However, have we found that this product could be much more effective if clinically proven key ingredients were a part of the formulation. The ultimate goal of the manufacturer should be to provide a solution to combat stretch marks as well as to promote internal healing and skin cell renewal. We find this might be the solution to the consumers which have reviewed this product and have not been pleased with the results.